In movies, someone’s twin usually has a mustache so you can tell them apart. In the case of the Nokia C2-02 and the C2-03, it’s an extra SIM card slot – it makes them different in one aspect, but exactly alike in all others. We’ve already reviewed the C2-02 and now it’s C2-03′s turn – it’s a dual-SIM, dual-standby phone with Nokia’s touch-enabled Series 40 software. 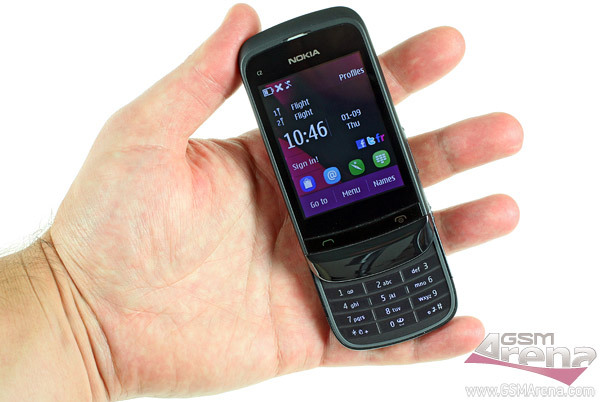 The Nokia C2-03 is a slider and while it’s far from the thinnest phone around, its curved body makes it quite comfortable to hold. Plus its sliding mechanism is pretty smooth and you get an easily accessible, hot-swappable second SIM card slot. The screen won’t blow people’s minds – 2.6″ QVGA TFT with resistive touch technology – but that’s still pretty decent for the class. The main attraction is the dual-SIM functionality. Using the SIM Manager app you can assign which functions are handled by which SIM – e.g. SIM1 can handle all calls and messages, while SIM2 could be used for mobile data. The Nokia C2-03 also features Maps for S40, which will help you plan pedestrian routes up to 10 miles (it uses the first SIM card for Cell-ID positioning).